The Clubs list has been updated. Stephen Wright's BC Chess Game Database has been updated. Jon Anderson is directing a five round swiss G/30 tournament to be held at the Roma Italian coffee bar on Commercial Drive on Sunday August 14 (that's right, tomorrow!). The Roma is familiar to some chess players on Commercial Drive and has been an on-again off-again haunt for some players for years. Registration is from noon until 1:00 pm and then the tournament will begin immediately. It should last until about 7:00 pm. It is not a rated tournament but because it is a version of "quickplay" (game/30), we encourage anyone who has a clock to please bring it (or even loan one if you can). No memberships of chess organizations is required. Entry fee is $10. There will be 1st, 2nd and 3rd place cash prizes which will total $300 ($150, $90, $60). The Roma is putting up $200 and Jon Anderson is guaranteeing the other $100. The winner's name is engraved on the Pontoni trophy which permanently resides behind the counter at the Roma. Jon has held the tournament irregularly over the last 20 years. If anyone requires any further information, they can contact Jon by email. A fund raising tournament will start tomorrow morning at 11:15 am (4 round swiss paring, CFC rated) and runs through Sunday. The tournament site is SFU. You can follow this page http://www.bjdy.com/juniorchess/events.html for upcoming junior events in June. Jack Yoos won the 30th Paul Keres Memorial. 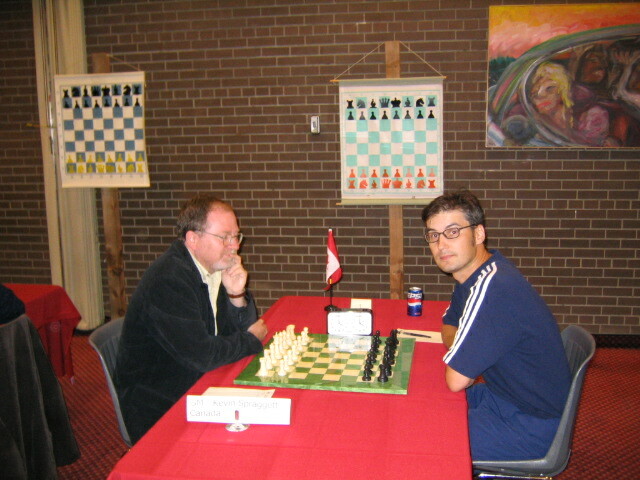 This is a reminder that the last event in Grand Prix series (Grand Prix #6) is on Sunday, May 15, 2005 at the bridge centre: http://www.chess.bc.ca/events3.html#jradultgrandprix , a perfect warm-up to the 30th Keres Memorial. 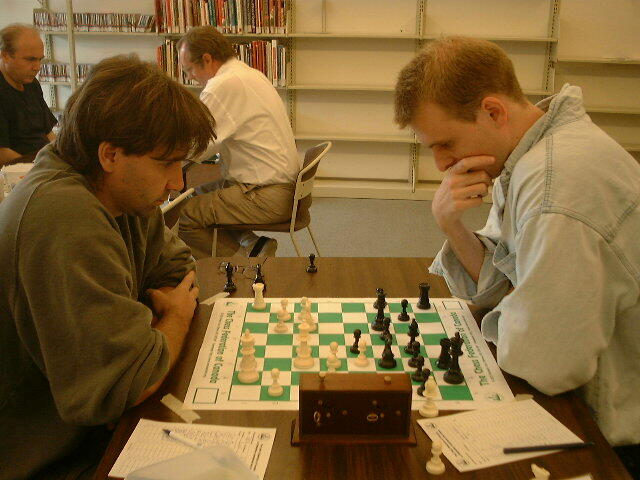 BC players at 2005 Washington State Elementary Chess Championship: a short report and some photos (http://www.bjdy.com/juniorchess/news.html). Thanks to some incredible last round time scramble heroics against organizer and TD Luc Poitras, James Kerry came first with 4/5 points; Vas Sladek, James Chan and Hee Seid tied for second with 3.5. Top junior went to Louie Jiang. Vas Sladek took some photos of the players in action. 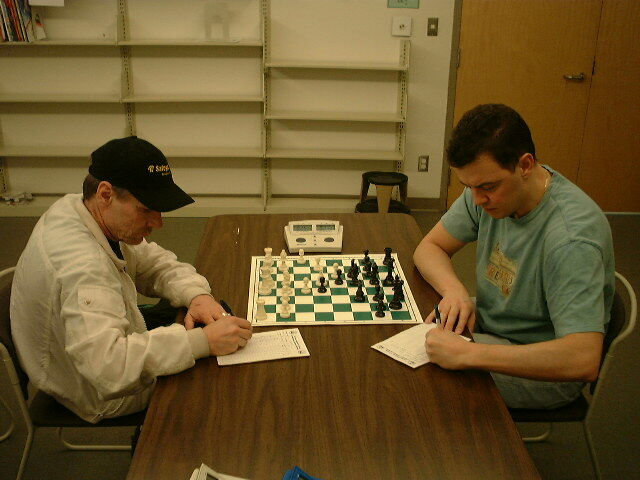 The eighth annual International Chess Jam for Youth chess players, will be held on February 12, 2005 at Ferndale High School in Washington State. Several BC chess players participated in the Skagit Chess Fest including Vlad Gaciu, Alexandra Botez and Tanraj Sohal. Ben Daswani is organizing a Vancouver Grand Prix. Added some photos from Henry Chiu's Marathon Chess Madness, held on August 28 and 29. Vas Sladek took some photos at the Western Canadian Open held July 9 - July 18 in Richmond. "Unsworth Elementary School Grade 5 teacher, Wendy Major, is justifiably proud. Just before classes let out for the summer, she sent a note to WIP explaining that the school's Grade 5 Team 1 took first place in the Grade 4/5 Division of the Second Annual Chief Dan George Chess Tournament on May 29. 'We had the same kids as last year, plus one new guy, so they knew the drill and had a very-clear goal,' notes Ms. Major. 'We took a Grade 5 Team 2 of kids from my class as well so you can see that Unsworth is still playing chess and that the tradition of doing so, grows every year.'" "Richmond's Lesley Cheng won't have far to go to play in her biggest chess tournament of the year. The Western Canadian Open began Friday at the Vancouver Airport Hotel and Conference Centre in Richmond. Cheng is the 77th seed with a 1,447 rating. Her sister Andrea is 85th with 1,240. They're among 91 chess players vying for $22,000 in prize money. American Georgi Orlov is the top seed. Swede Pia Cramling and Spaniard Juan Manuel Bellon Lopez are second and third-ranked." If you are not on the players list, you can register on site. Please follow the tournament website for details and daily updates. Vas Sladek took photos of the GM Simul held on July 4 at St. John's School in Vancouver. There are now approximately 27 confirmed participants in the GM Cramling and Bellon simuls, with a number of "probables". A photographer from the Vancouver Sun will be coming to the July 4 simuls, as well as a reporter from the Richmond News. An article on GM Cramling, the July 7 Pairs event and the Western Canadian Open is scheduled to appear in the Vancouver Sun on the morning of July 7. There will be a concession for snacks and we plan to order pizza for consumption between the two simuls. Anyone interested in playing should e-mail me directly to let me know. This is a reminder that current discount for Western Canadian Open is ending in 3 days (25% additional discount for junior players). So far 80 players have registered. You can register online. The latest details are on the Website for the 2004 Western Canadian Open. A Preregistration List is available. George Hara's Kamloops Grand Prix for 2004 has been cancelled. The Western Canadian Open will be held July 9 to 18 at the Vancouver Airport Conference Resort. Latest details are at www.chessbc.com. IM Vitomir Arapovic demolished his opposition 9.5-0.5 in a June 3, 2004 chess simul organized by northshorechess.com and generously hosted by the Croatian Cultural Centre. Our new domain is now up and running. The new server will also allow several improvements to the site that were not possible on the old server. Added a photo gallery from the 2004 Keres Memorial. 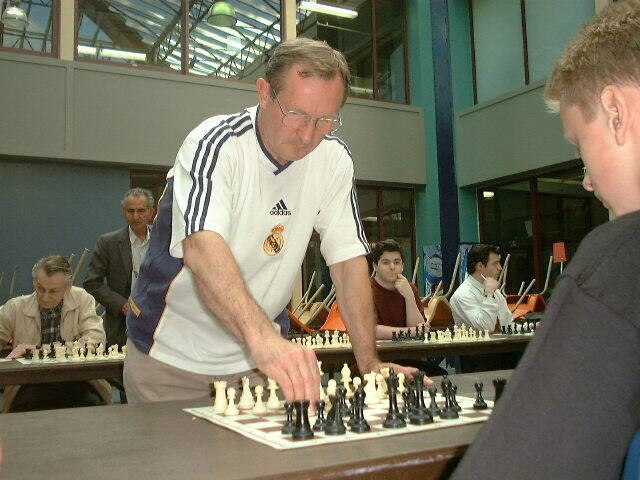 IM Georgi Orlov won the Open Section of the 2004 Keres Memorial with 6.5-0.5. Vicente Lee won the Under 2000 section, and Brian Bowes was first under 1600. Download the 2004 games in PGN format (preliminary copy). Henry Chiu's 24 Hour Marathon will be held on August 28. After three rounds at the 29th Annual Paul Keres Memorial, Georgi Orlov and Jack Yoos lead the field with 3 points. Prizes: first player to defeat or draw Arapovic wins a prize. Registration: interested players MUST pre-register to play; no walk-ins. The Junior Chess Schedule for 2003-2004 has been revised. 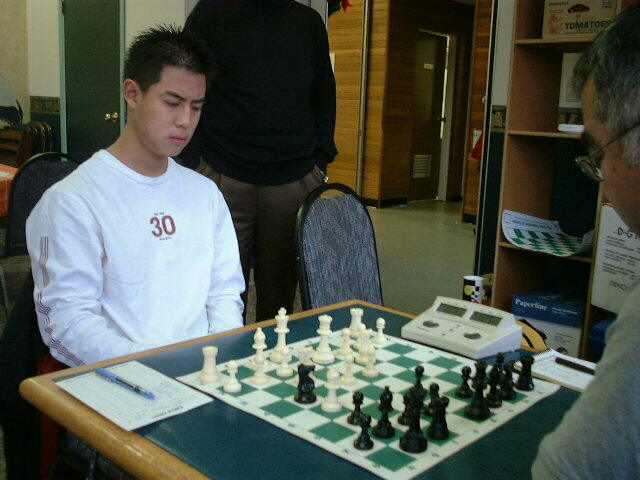 Jack Yoos won the 2004 BC Closed Championship. The games are available in PGN and Chessbase formats. A photo gallery from the 2004 Championship is available. The Rod Planas Memorial Tournament will be held on August 7 and 8 in Kelowna. Come play bughouse - a great way to have fun, while helping to raise money for a very worthwhile cause: The 2005 Elod Macskasy Memorial. Date: Sunday, April 25, 2004. Place: Van. Bridge Centre - 2776 E. Broadway @ Kaslo St. Entry Fee: $15; $10 for juniors and seniors. Entrants receive a $5 discount for pre-registering. Format: Minimum 8 rounds of 6 games each. More Info: Ben Daswani - devil1331@hotmail.com. Note: All proceeds will go towards the Elod Macskasy Memorial. Tournament will be rated using the Bughouse BC rating system (visit the link below). An open fundraising event, the Pairs 4000 Tournament, will be held on March 20 at the Vancouver Bridge Center, to raise money to help bring titled players to the 2005 Elod Macskasy Memorial tournament. Contact Richard Reid rreid@smartt.com for more details. There are a hundred and one tasks, large and small, to be completed before and during the Western Canadian Open, to ensure that this year's premiere event is a memorable one! If you are willing to help out, please contact Bruce Harper at bruce54321@shaw.ca. The 7th Annual International Chess Jam 2004 took place Saturday, February 14 at Ferndale High School in Ferndale, Washington. 101 students from Canada to Seattle competed, with a few visitors from Oregon also thrown in for good measure. (31 players in the High School section, 70 in the Junior section.) In all, 320 tournament games of chess were played and will be rated by the Washington High School Chess Association. Jason Lee, 11th grader from Seaquam Secondary School, Vancouver B.C., is the new Chess Jam Grand Champion, scoring 4 wins and 1 loss. Lo-Ching Chow, 8th grader from Seaquam, Vancouver, is the Chess Jam 2004 Junior Champion, scoring 6 wins and 1 draw in the 7-round Junior Division. Richard Huang, 5th grader from Edmonds Community School in Burnaby, placed 2nd Overall in the Junior division, losing only to Lo-Ching Chow in the semi-final round. David Choi, 4th grader from St George's Junior School, scored 3 wins of 7. 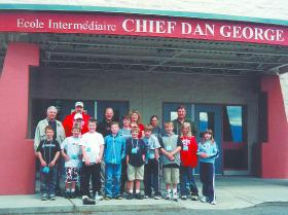 The full International Chess Jam 2004 crosstable, along with results and news of other scholastic events in Northwest Washington, can be found at the Northwest Washington Scholastic Chess website at http://ourworld.cs.com/kaech5 . 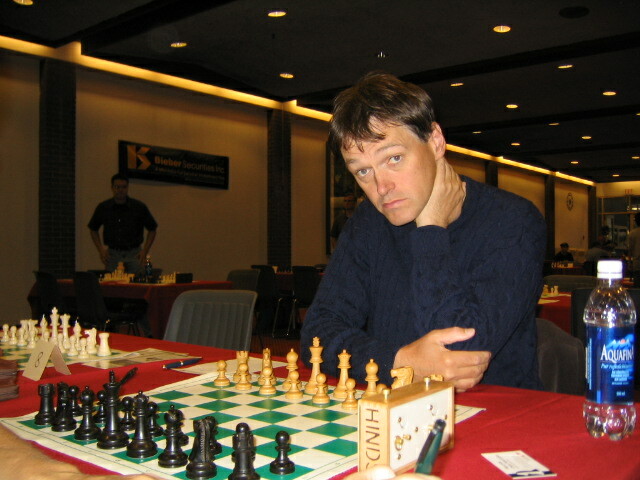 Grant Rice, who is directing the upcoming Kelowna Winter Fest Chess Tournament 2004, is also organizing a Regular rated round robin in March 2004 for a smaller number of players. The games will be played on Sunday in Kelowna. He is thinking about the last three Sundays in March. If interested, please contact Grant Rice at 250-979-0009 or ridebike@okanagan.net. Last year saw 7 players play 5 Sundays with Mike Kindret finishing undefeated. An exhibition match is being held between the Little Mountain Chess Club and the Croatian Chess Club. A blitz tournament and a party will follow the match. The Little Mountain Chess Club will be led by Lucas Davies, recent winner of the Vancouver Class Championship. The Croatian Chess Club will include several masters and experts, including a former BC champion. 3250 Commercial Drive Vancouver B.C. Entrance through the Members Lounge or Restaurant. Everybody is welcome to attend an exhibition match between the teams of The Croatian Chess Club and Little Mountain Chess Club. Stephen Wright's BC Chess Game Database has a new supplement. Seven, yes, seven rounds of chess in the 4th-8th grade division (normal Swiss), five rounds for the High School (9th-12th grade) division (Game/45 "McMahon" Swiss pairings). Dubbed "International" because this event sees some good British Columbia players make the short trip down for a piece of the action. In fact, Canadian players won both divisions last year! Full details, map, last year's results, how to enter from Canada, T-shirt info, FAQ etc. are at http://ourworld.cs.com/kaech5/jam04.html . If no web access, email TD Kaech at kaech5@cs.com for entry details. On Saturday, January 31, 2004, the British Columbia Chess Federation will hold the preliminary round of the British Columbia primary school team championship. This event is open to all elementary schools (grades 1-7) in the province. The top 6 teams (only) will advance to the finals, to be held at St. George's Senior School on February 28, 2004. Space is limited, and therefore entries will be accepted on a first-come, first-served basis. Each school is limited to two teams in each event. Players may only play for the school they attend. This includes the Dec.17 NW Vancouver - Surrey match using Peter's new reporting format. Michael Yip won the last stage of the Little Mountain Active Grand Prix, but Lucas Davies became the absolute champion of the Grand Prix. Mehrdad Yousefzadeh and Louis McCusey won The Vancouver Winter Chess Tournament. Twenty players competed in the tournament. Ten of these players were adults, and the other ten were juniors. About seven of players were on the 1000-1500 range, and the rest were on the 1500-2000 range. 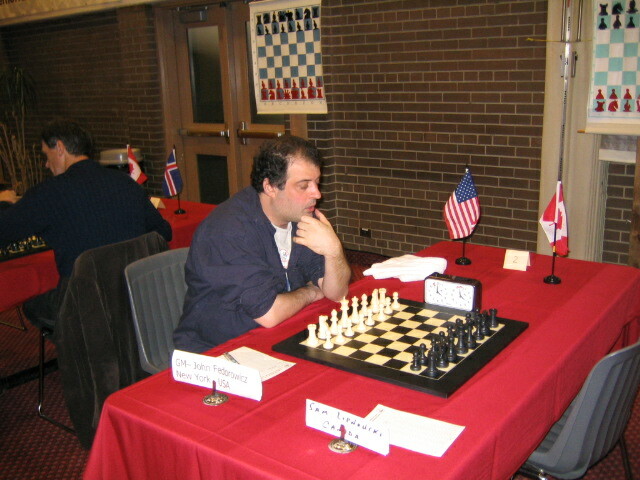 Mehrdad Yousefzadeh won the upper section by winning all of his games. Second place was shared by Edward Tang, Richard Reid, and Peter Yee, all of them got 3 points. Louis McCusky won the U1500 section with 3 points. Second place was also shared by four people: Tiffany Tang, Richard Huang, Laura Harper and Lara Heppenstall all with 2 units. In addition to the prize money, Mehrdad received a copy of Fritz, and Louis a CD with an edition of ChessBase Magazine. These prizes were courtesy of ChessFirst! Enterprises. 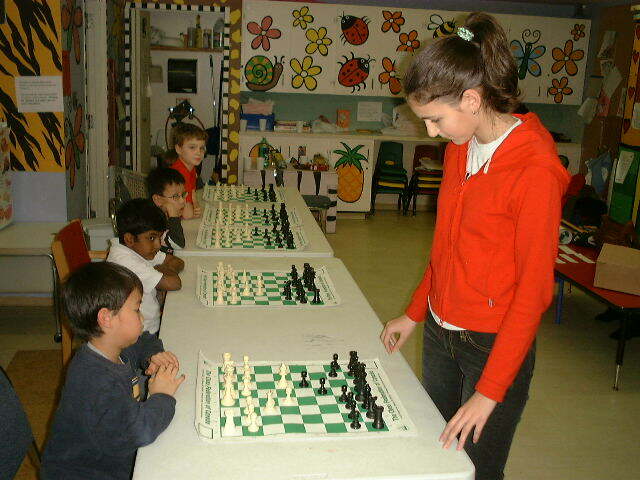 Valentina Goutor won all of her games with the exception of one draw at the Simul that she kindly gave at Little Mountain Neighbourhood House. 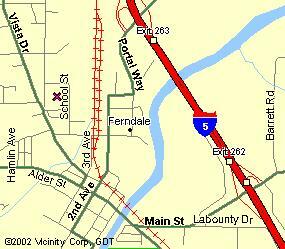 BC players from 4th - 12th grades are invited to Ferndale, Washington (15 minutes south of the border) to participate in the seventh Annual International Chess Jam 2004, to be held on Saturday, February 14, 2004. Full entry information can be found at http://ourworld.cs.com/kaech5/jam04.html . 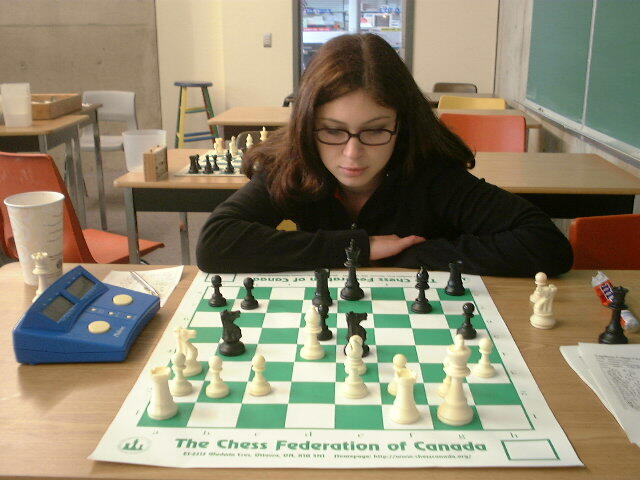 Valentina Goutor (BC women Champion 2003) will be giving a simul for juniors U1500 at the Little Mountain Chess Club. SIMUL Date & Time: December 17 at 8:00 PM; 2 games for $3.00. The Little Mountain Chess club is hosting the Vancouver Winter Chess Tournament at the Bridge Centre on December 20 and 21st. If it is possible, please distribute the information with members of your club. Everyone is welcome. Updated Len Molden's report on the BC - Washington State Match with the match result. Added Len Molden's report on the 2003 BC - Washington State Match. Advance registrations are now being taken for the Western Canadian Open which will be held July 9 to 18, 2004. Details are at the event site www.chessbc.com. 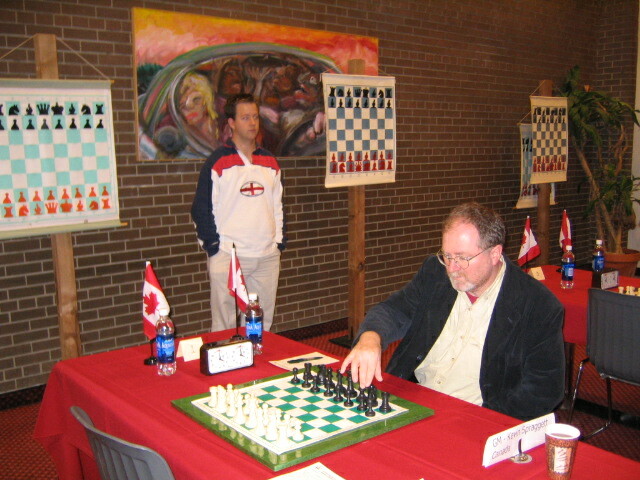 The Alberta Chess Association is hosting the 2004 Canadian Junior Championship, January 2-6, 2004. A free entry will be given to any provincial junior champ who provides an official letter or e-mail letter from a provincial association. Advance registrations are now being taken for the 29th Annual Paul Keres Memorial. December 6th will witness the first adult B.C. - Washington team match in over twenty-five years; the ten-board adult match will take place at the same time and location as the scholastic match, at the Student Association Campus Centre at BCIT, starting at 11:00 am. The B.C. players scheduled to take part are: Oliver Schulte, Jack Yoos, Bruce Harper, Brian McLaren, Dan Scoones, Harry Moore, Laszlo Tegzes, Mike Stanford, Dragojlub Milicevic, and Jesse Bouvier. Lynn Stringer will be the TD, Len Molden is the B.C. organizer, and the team captain is Joe Oszvald. Spectators are welcome. Eduardo Azmitia reports: James Chan won the first edition of UBC's Any Given Sunday very convincingly. He seemed unstoppable until he lost his last game to Willian Jung, who ironically was defeated by the lowest rated player of the tournament in a previous game. I am quite safe to say that the players enjoyed the tournament and created a very nice and friendly enviroment with good sportmanship. Look forward seeing you in the next edition. We will have Any Given Sunday on December as well, I just have to confirm the room numbers. Next year, we will continue with the same style of tournament, but it is still undetermined the day and time. We might have to move it to saturdays. It depends on room availability, and other tournaments as we will try to accomodate in order to avoid overlaps. The Junior Chess Schedule for 2003-2004 has been updated with a link to the BC Junior Championship. Players are more than welcome to join the next stage of the Little Mountain Grand Prix. Here are the standings. Lyle Craver was recognized by North Vancouver District Council on Oct.6, 2003. Updated: BC Championship crosstables, updated, and with a separate page for FIDE reports; BC Champions, updated (1932 and 1933 added); 1961 BC - WA Match, revised. The Western Canadian Open will be held July 9 to 18, 2004. Details are at the event site www.chessbc.com. Join fellow chess enthusiasts on Saturday, Nov. 15, 2003, for a full day of entertainment by challenging assorted masters in a continuous simultaneous exhibition. Here's your chance to play against GM Duncan Suttles, FM Oliver Schulte, FM Jack Yoos, FM Bruce Harper, Fanhao Meng, Luc Poitras and other masters and experts. Vaclav Sladek took photos of the DGT XL Vancouver FIDE Match. Fourteen (14) speed chess players required as "special skill extras" for Blade 3 movie to be shot in Vancouver. Proposed date is October 8 at $25.50/hour. No age restrictions, recent photo required. Chess First! Enterprises, chessfm@shaw.ca, 604-787-4553 (voice mail) or Chess First! Enterprises 408-1641 Lonsdale Avenue, North Vancouver, BC, V7M 2J5. A movie company is filming the motion picture "Blade 3" and needs 14 speed chess players on Wednesday, October 8 from 8:00 AM - 12:00 Noon. The pay is $25.00 an hour. You'll also probably get some catered food and a chance to work with a movie star like Wesley Snipes (and maybe some others). If you're interested in participating, please inform me as soon as possible. 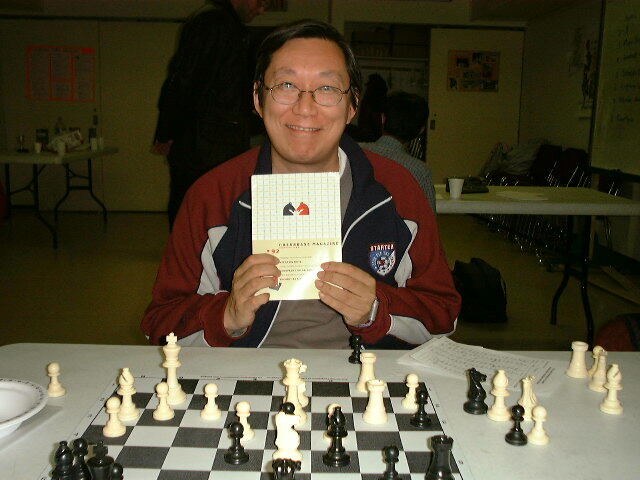 Peter Yee of the Surrey Chess Club will be providing the final list to the movie producer. The Junior Chess Schedule for 2003-2004 has been released. Stephen Wright has assembled a BC Chess Game Database. Supplements and upgrades will be provided on a regular basis. Titles approved at the 2nd Quarter FIDE Presentational Board Meeting included the awarding of the International Arbiter title to Mark Barnes, Lyle Craver, and Lynn Stringer. Challenge the Masters at the Multi-Master Simul Tournament. A 2005 Elod Macskasy Memorial Fundraising Event will be held September 7, 2003, at the Vancouver Bridge Center. Join fellow chess enthusiasts for a full day of entertainment by challenging three teams of masters in a 3 round simultaneous tournament. Here's your chance to play against teams consisting of GM Duncan Suttles, FM Jack Yoos, FM Bruce Harper, Fanhao Meng, and other masters/experts. George Hara's Kamloops Grand Prix for 2004 has been revised. Practice your openings and improve your chess, by playing in a quiet and beautiful park! You get to know the pairings one day before, so you can study your opponents, and your home preparations will surprise us! Games, often annotated by players or masters, will be available. Entry Fee: $5.00 Free entry for the highest rated player! Prizes: 1st - $30.00 2nd - $20.00. Location: Bear Creek Park, Surrey, B.C. The covered area on 140th Street side. The park is between King George Hwy, 140th Street, 88th Ave & 84th Ave.
To get there, you can take a bus from King George skytrain station. Participants and pairings: based on FIDE or CFC ELO active rating system. Sponsors: none (so far). All sponsors will be advertised on this website. Registrations: via e-mail at: nickbeqo@hotmail.com Dead line: Friday 11:00 PM. Bring your own chess set, and clock. a) Sportsmanship is required. No draw offers or draw claims, unless DEAD DRAW! This rule is not only because it is a speed chess tournament, but also because there would be no room for pre-arrangements in order to split the prize. It will be unfair to other players. 1. unrated tournament with 12 players, and 15 min time control. 2. rated tournament with 6 players, and 25 min time control. c) I am organizing this tournament in order to help chess players, especially in Fraser Valley, as it is too far to play in Croatian Center or Vancouver Bridge Center. Therefore, chess players are going to make the tournament rules, not me. I am open to suggestions and make the respective changes. Remember: 100% of the entry fees go to prizes! I appreciate your time and your help! Early Registrations for the BC Open, August 2-4, can be sent to the BCCF, PO Box 15548, Vancouver BC, V6B 5B3. This BC Championship Qualifierwill be a FIDE rated event. Tournament details are available on the Forthcoming Events page. George Hara's Kamloops Grand Prix for 2004 has been announced. Dates: Every Sunday, sunny or rainy! Prizes: 1st - $70.00, 2nd - $30.00. Bear Creek Park, 140th Street & 88th Ave, Surrey. Entrance from 140th Street. Bring your own chess set, clock, score sheets, coffee or snack! You have to write the game until the last 5-min for Internet coverage. No arguing or complaints, or just do not play! Received: Mad Chess Festival Flyer. To all chess organizers in British Columbia. The 2003/2004 Tournament Schedule is being put together at the end of June 2003. Please submit your tournament dates now so that any conflicts can be worked out as quickly as possible in early July 2003. Robert North, Tournament Coordinator, BCCF. Jonathan Berry's column in the May 31 issue of the Globe and Mail reports on the game Orlov - Yoos from the Paul Keres Memorial held in Vancouver on the Victoria Day Weekend. Friday Night Chess Tournament hosted by the Croatian Chess Club. May 26: Junior Event: Chess Party at the Vancouver Bridge Centre! 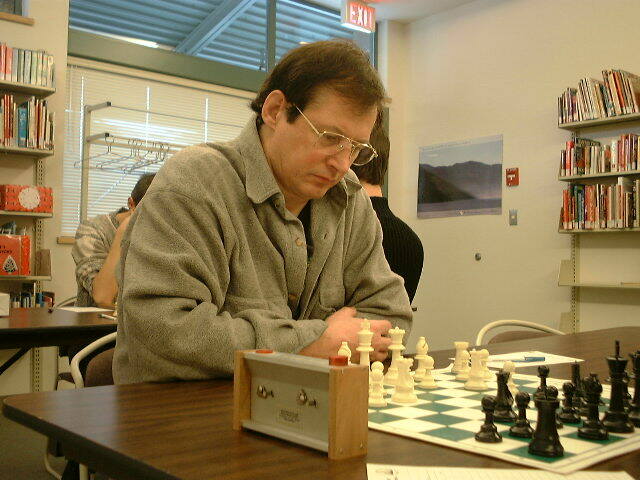 Joe Oszvald was elected president of the BC Chess Federation. The Junior Chess Schedule for 2002-2003 has been updated. Bruce Harper resigns as BCCF President. The result of the Feb.19 chess match between North Vancouver vs. Vancouver is posted at: http://www.chessmastery.com/ ...link titled "Lower Mainland Chess Club Team Results". 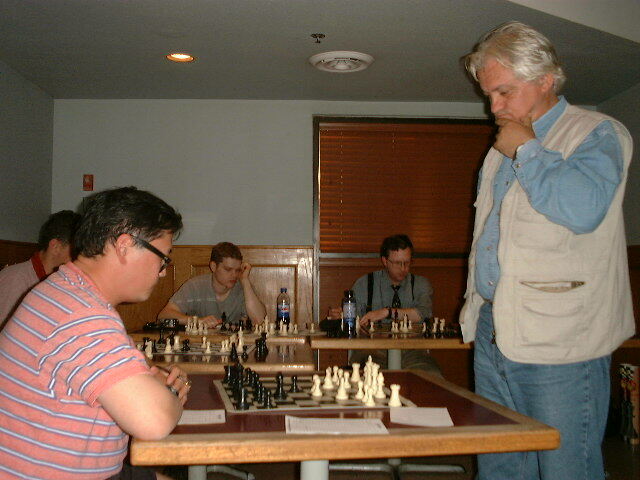 The result of the Feb.12 chess match between North Vancouver (Oszvald, Tegzes, Skulsky, Pascuzzi, others) vs. Surrey (Zuk, McLaren, Fullbrook, Meng, others) is posted at: http://www.chessmastery.com/ ...link titled "Lower Mainland Chess Club Team Results". The results of the February 1 chess matches played between North Vancouver and Langley are posted at: http://www.chessmastery.com/ ...link titled "Lower Mainland Chess Club Team Results". 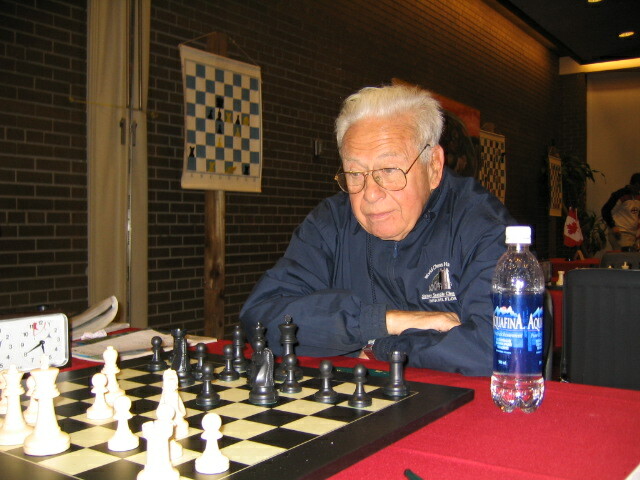 Organizer and TD Vaclav Sladek managed to lure Robert Wilkins and George Kosinski out of long retirements and then proceeded to win the event with 4/5. Eduardo Moura and George Kosinski tied for 2nd and 3rd with 3.5/5. All players received free toques from Raising the Roof, a national project raising money for the homeless through the sale of toques every February. The results of the Jan.20 chess match between Langley vs. Abbotsford ...and the Jan.21 chess match between: Port Coquitlam (Basanta, Yoos, Milicevic) vs. Surrey (Zuk, McLaren, Fullbrook) are posted at: http://www.chessmastery.com/ ...link titled "Lower Mainland Chess Club Team Results". The winner was Valeria Gansvind with 4.5 drawing only with Gerry Neufahrt and winning $120.00. Valeria left for Moscow today to play in a Women's chess tournament but she will not be there in time so will have to take 2 ½ point byes. Gerry played well, drawing with Valeria and Mike Stanford but losing to Harry. Second place went to Harry Moore and Greg Churchill with 4-5. winning $75.00 each First under 2000 combined with first under 1600 went to James Chan and 11 year-old Evan Raymer with 3-5 winning $52.50 each. Evan also won the top junior prize. Three juniors played in the tournament and Sam Churchill won the best Upset Prize. The result of the Jan.16 chess match between Port Coquitlam vs. Vancouver is posted at: http://www.chessmastery.com/ ...link titled "Lower Mainland Chess Club Team Results". On Saturday, February 1, 2003, the British Columbia Chess Federation will hold the preliminary round of the British Columbia Elementary School Team Championship. This event is open to all elementary schools (grades 1-7) in the province. The top 6 teams (only) will advance to the finals, to be held at St. George's Senior School on February 22, 2003. Space is limited, and therefore entries will be accepted on a first-come, first-served basis. Each school is limited to two teams in each event. On Saturday, February 22, 2003, the British Columbia Chess Federation will hold the following two separate events: - The Elementary School Finals (grades 1-7), open to 6 elementary schools qualifying from the preliminary tournament held February 1, 2003 at West Point Grey Academy; - The Secondary School Championship, open to all secondary schools in British Columbia. Players from grades 8 to 12 may play in this event. Space is limited, and therefore entries will be accepted on a first-come, first-served basis. Each school is limited to two teams in each event. The results of the Jan.7 chess match between Langley vs. Surrey and the Jan.9 chess match between Port Coquitlam vs. Abbotsford are posted at: http://www.chessmastery.com/ ...link titled "Lower Mainland Chess Club Team Results". Canadian scholastic players from 4th - 12th grades are invited to Ferndale, Washington (15 minutes south of the border) to participate in the 6th Annual International Chess Jam 2003, to be held on Saturday, February 15, 2003. Details at http://ourworld.cs.com/kaech5/jam03.html . The result of the Dec.17 chess match between Vancouver (Poitras, Deline, Pehisker, others) vs. Surrey (Zuk, McLaren, Fullbrook, others) is posted at: http://www.chessmastery.com/ ...link titled "Lower Mainland Chess Club Team Results". Every Friday, 17:30 - 23:30, admission free. All levels welcome. Chess lessons for chess players will be taught by Roman Jiganchine from 10 am to 12 noon on every Saturday in November. Details please phone 604-266-0974 or 604-263-4321. Dave Moore drew with Ian Higgs in the penultimate round to secure first place with 4.5/5 in the Kelowna Harvest Swiss played Oct. 19, 20. Section winners were Ian Higgs 4.0 , Parish Barabana 3.0 and Marshall Rasmussen 2.5. Vaclav Sladek took photos of the BC Championship. Organizer Gavin Steininger and TD Balin Fleming combined to put on a successful active event at the Capilano College Chess Club. Vas Sladek came first with 4.5/5 points after taking a last round bye, 2nd went to Gavin Steininger 4.0/5, 3rd went to Balin Fleming 3.5/5 and Jarmila Ruzicka, the only girl in the tournament, came 4th with 3.0/5. The BC Closed 2002 crosstable is here. and the new Junior Grand Prix competition has been organized. Esquires Coffee House no longer holds Saturday weekly tournaments. Luc Poitras and Joe Oszvald tied for first place with 6/7 in an active event organized by the North Vancouver Chess Club (www.northshorechess.com). Vas Sladek needed a lot of 'luck' to tie for third with Joe Oszvald's star student, Gavin Steininger. Watch for more active tournaments in the fall on the North Shore and come join the fun! All British Columbia juniors aged 8-17 are invited to participate in the Hot Summer Chess Grand Prix series of tournaments taking place this summer in Bellingham, Washington, USA. The first one takes (took) place on Monday, June 17. Details can be found at the Northwest Washington Scholastic Chess website, http://ourworld.cs.com/kaech5/ . The North Vancouver Chess Club held a successful simul with club champion Joe Oszvald taking on eleven players. After a few quick victories by Joe the club came back to beat Joe 7-4! Some of the games. and . Added Luc Poitras's report on the Pascal Charbonneau Simul. 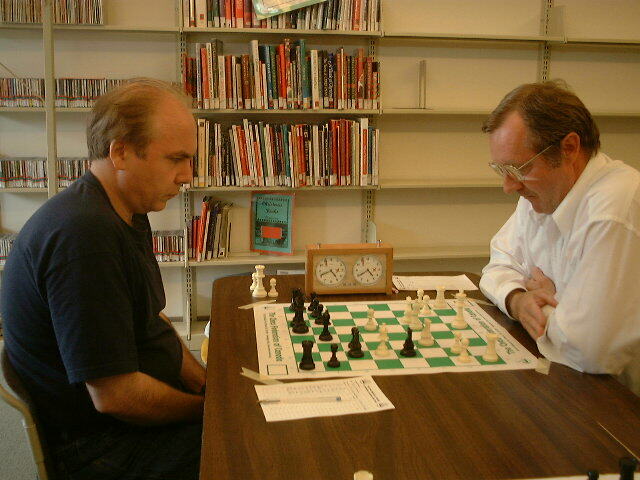 On June 23 Ben Daswani and Bruce Harper will be organizing a Bughouse Chess tournament at the Vancouver Bridge Centre. 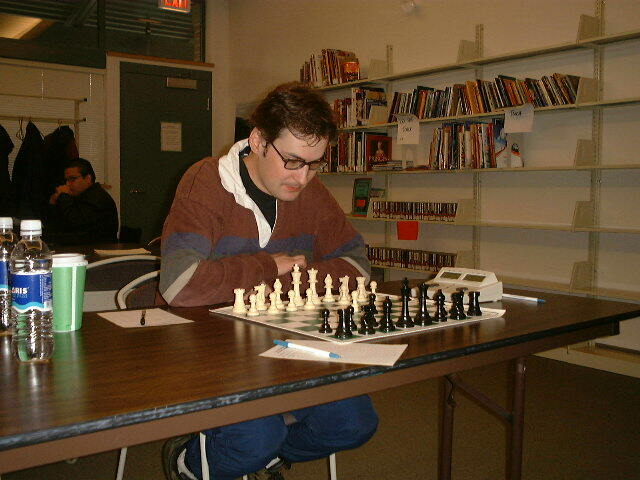 The 2002 North Vancouver Chess Club Championship finished last week with club veteran and top-ranked Joe Oszvald taking first, Vas Sladek was a point behind in second and third went to Balin Fleming. The event was sponsored by Bergetti.com, Canada's Chessbase distributor, www.bergetti.com/chessbase and The Internet Chess Club, www.chessclub.com. 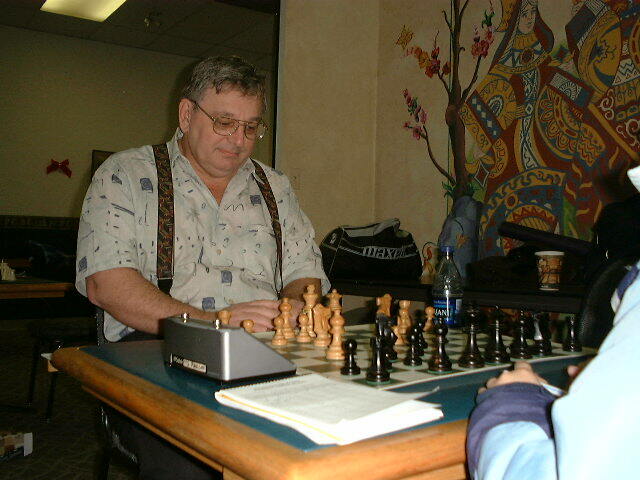 Wed. June 5, 2002, Joe Oszvald will give a simul at the North Vancouver Chess Club, St.Thomas Aquinas high school, 541 West Keith Rd., 7pm, $1, spots by reservation only: contact Vas at 604-982-0611. Simul sponsored by the World Chess Network, www.worldchessnetwork.com, prizes to anyone beating or drawing Joe. 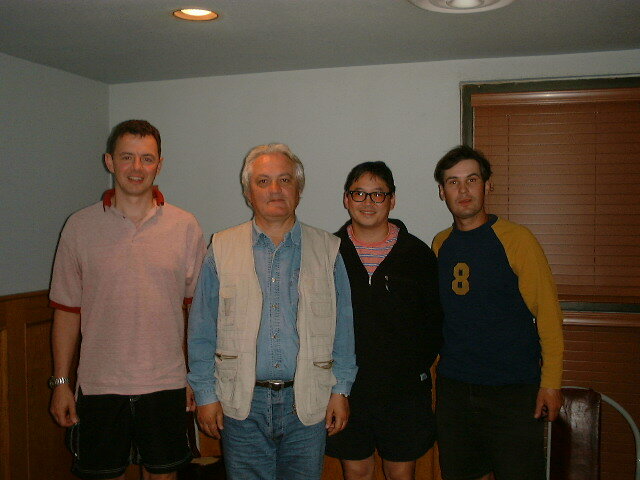 Georgi Orlov, Jack Yoos, Besnik Beqo, and Fanhao Meng tied the open section of the 2002 Paul Keres Memorial. Steven Sadoway won the under 2000 section, and Meir Lakhovsky won the under 1600 section. Games from the tournament can be downloaded from here at games/Keres2002.cbv. Peter Stockhausen's report is available here at report.html#D20020520. Simul by Pascal Charbonneau, (Canadian Chess Champion) on Wednesday May 29th at the Vancouver Bridge Center ( 2776 East Broadway , Vancouver). Game start at 7h00pm. Fee: $15. To register, call Luc Poitras at 604-438-0496. 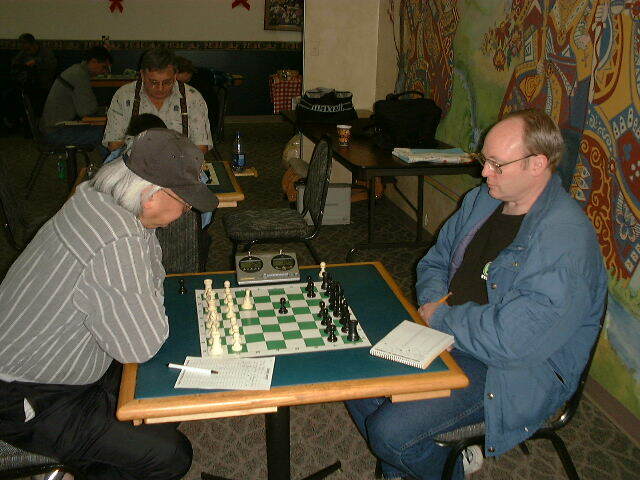 Larry Christiansen and Pascal Charbonneau will play the 1st WorldChessNetwork.com North American Championship Match June 10 -16, 2002, at the Vancouver Airport Conference Resort, 10251 St. Edwards St., Richmond. Added Peter Stockhausen's report on the 2002 Canadian Zonal Championship. Canadian Youth Chess Championship Regional on April 21st. Players participating in the 2002 Canadian Zonal Tournament. NEW TOURNAMENT: 5 game weekly. One game per Saturday for 5 weeks, starting Sat., March 23rd to Sat., April 20th, 2002. Time: 1:00PM - 5:00PM. Time control: 2 hours. Prizes base upon entries. Special prize by random draw last day of tournament - one "Your Move" chess poster which has been donated. TD: Justin Hardy. Location: Esquires Coffee House, 4300 Kingsway, Burnaby, B.C. Canada. This event is not CFC rated. Bring sets and clocks. Registration: Sat., March 23rd, 12:45PM. All levels welcome. OLD TOURNAMENTS: The regular Saturday, 15 min. time control tournament at Esquires has been wound down until further notice. The regular Sunday, 30 min. time control tournament at Esquires requires a new tournament director. This task could be shared by one, two or even more commited players. The regular Sunday 30 min. tournament in Greater Vancouver dates back to the days of the "Black Dog" and "Myles of Beans" locations, and it is hoped that someone(s) will step forward to take on the TD duties. Without a TD, the Sunday 30 min. tournament will be wound down. If interested in performing the duties of TD on a regular basis, and thereby rescuing this long standing weekly chess event, please contact Dan Chapman at ideez@yahoo.ca. Note: Esquires Coffee House is chess friendly. Casual games anytime during regular hours. Giant chess pieces available. Visit Esquires at 4300 Kingsway, Burnaby. A short walk from Patterson Skytrain station. Nick Beqo's chess website has been updated, with a new permanent address: http://www.nickbeqo.com/. the unveiling of its live broadcast technology. an Internet connection the ability to watch these matches. 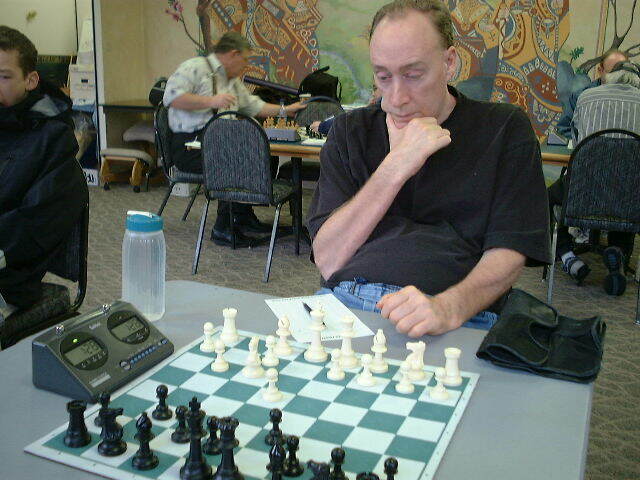 United States Chess Champion, Grandmaster Larry Christiansen. by chess organizers, International Grandmasters and patrons of the game. for developing the world's strongest chess playing software. Board of Directors and has been an active promoter of chess worldwide. for the World Chess Network. in over 11 Chess Olympiads and has won the U.S. Chess Championship 3 times. Annual Junior Open rescheduled to February 10, 2002. A Qualifier for the 2002 Canadian Closed will be held March 1-3 in Vancouver. Every Wednesday at the Bridge Center, join a Chess Club for kids and teenagers. and followed by a chess tournament with clock (G/15). Every participant will play 4 games. Everything finishes around 9h00 p.m. Address: 2776 Broadway East (between Nanaimo and Renfrew), Vancouver. Junior Open for Jan.27, 2002 has been postponed due to weather. Chess @ Esquires. New for 2002, 5 rounds over 5 weekly Saturdays. TD: Steve Morgan. Entry fee: $10. Time control: 40 moves in 1.5 hrs, then 30 min. sudden death. First round: Saturday, January 5. 2002, 1:00PM. Esquires Coffee House, 4300 Kingsway, Burnaby, corner of Kingsway and Wilson. Other regular tournaments at Esquires continue: Saturdays @ 4:00PM, 15 min., 5 rounds, $5; Sundays @ 1:00PM, 30 min., 5 rounds, $7. Bring sets and clocks. Added Stephen Wright's report on the 2001 BC Junior Championship. Added Bruce Harper's report on the December 9, 2001, BC Junior Speed and Siamese tournaments. Added Stephen Wright's report on the 2001 BC - Wahington Match. The BC Junior Speed Championship , BC Junior Siamese Championship, Christmas Party will be held on December 9, 2001 at the Vancouver Bridge Centre, 2776 East Broadway, Vancouver. Added Lynn Stringer's photo gallery from the Silver Star Classic to the BC Chess Reports page. The winner of our tournament and qualifier for the B.C. Closed was Barry Dyck of Vanderhoof. The second place winner was Nicholas Taylor and third was John Niksic, both from Prince Rupert. The crosstable and games from the 1957 Canadian Championship have been added to the British Columbia Chess Games Database. The Northern BC Qualifier for the BC Closed will be held in Burns Lake on October 27 and 28, 2001. The webpage for the 2002 Canadian Closed is now available. Central Park Chess Club is pleased to announce a Development Chess Simul with National Master Roman Jiganchine. The purpose of this simul is to improve game play. Added Lynn Stringer's photo gallery from the Victoria Labour Day Open to the BC Chess Reports page. The Thanksgiving Open will be held at the Vancouver Bridge Centre. DEVELOPMENT NIGHT - Thursdays, 7:00PM-9:30PM. Open and varied activities especially for lower ranked players. 5 MIN. BLITZ - Saturdays, 1:00PM-4:00PM. 10 rounds. Entry fee $5. 15 MIN. TIME CONTROL - Saturdays, 4:00PM-7:00PM, 5 round Swiss. Entry fee $5. 30 MIN. TIME CONTROL - Sundays, 1:00PM-7:00PM, 5 round Swiss. Entry fee $7. Casual play anytime during regular hours. Giant Chess pieces available. For further info. contact Daniel Chapman, ideez@yahoo.ca. 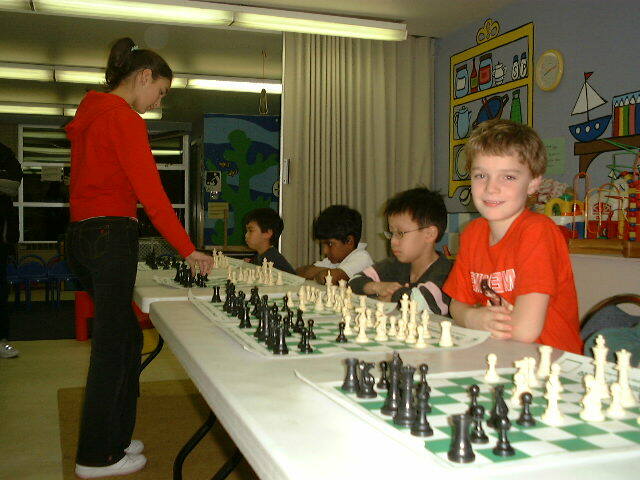 is pleased to announce the September, 2001 activity for the the Vancouver Junior Chess Club at 2265 West 41st. The club will be free for students who register for our math lessons. Non-Math and Chess students pay drop-in fee $5.00 for 2 hours each Saturday from 2:30 pm to 4:30 pm. Further info can be obtained by phoning 604-263-4321. The tournament date is confirmed: Sunday, August 12. The entry fee will be ten dollars.There will be a trophy to contend for. It will be unrated and 30 minutes per side. Participants should bring their own equipment. John Anderson will direct. The prize fund will be 500 dollars guaranteed. (But no more than 500). Entry fee will include a coffee or tea. Savo has agreed to roast a suckling pig, which will be available to players. Spanish coverage of the 26th Paul Keres Memorial is available at http://ajedrezactual.com/keres01.html . Mehrdad Yousefzadeh and Jason Lee won the under 2000 section, and Yaroslav Goutor won the under 1600 section. Games from the tournament can be downloaded from here at games/Keres26th.zip. Every Wednesday from May 30, at Vancouver Bridge Centre, join a chess club especially for kids and teenagers. The chess club opens its doors at 6:45PM, beginning with a lecture by Luc Poitras and followed by a chess tournament until 9:00PM. 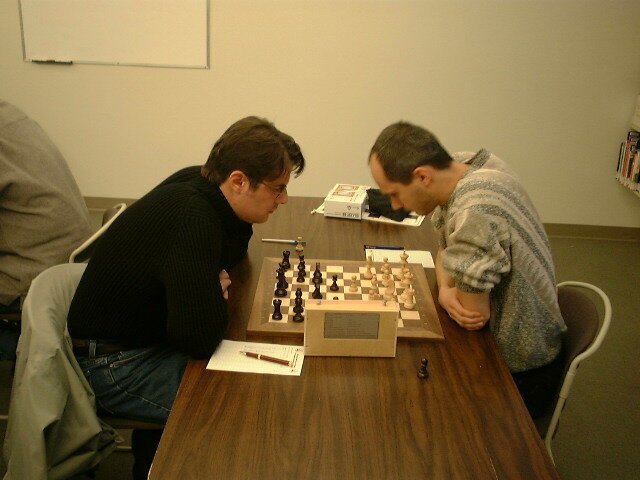 Dragoljub Milicevic won the 2001 BC Closed Championship, and qualifies to play in the Canadian Closed Chess Championship, to be held in Montreal between August 21 and August 29. US National Master David Gliksman won clear first in the BC Open, held on the Easter weekend. Luc Poitras took second prize, and qualifies to play in next year's BC Closed. SIMUL CHESS EVENT FOR CHARITY Presented by: Esquires Coffee House and Central Park Chess Club. Come play a Chess Master, have fun and support a worthy charity. 100% of all fees to the Multiple Sclerosis Society of B.C. A simultaneous exhibition of Chess by Master Rex Balbuena. Saturday, April 21, 2001. Registration 12:00 noon. Entrance fee $5. Esquires Coffee House, 4300 Kingsway, Burnaby, B.C. Canada. All ages, all levels welcome. For further info. contact Daniel Chapman, ideez@yahoo.ca. Jack Yoos gave a lecture at the Vancouver Bridge Centre about the recent Chess Olympiad held in Istanbul. Those in attendance heard behind the scenes details about the tournament and its players, and Jack analyzed a game from the event that was not previously covered by his recent article in En Passant. Added Lynn Stringer's photo gallery from the Victoria Spring Classic to the BC Chess Reports page. 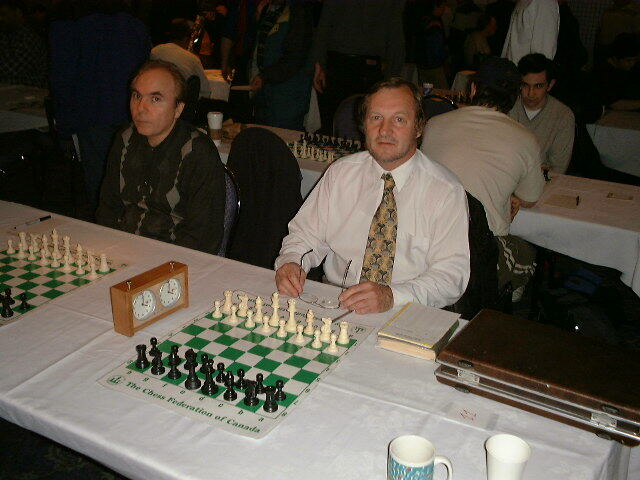 Added Jonathan Berry's photo gallery from the 2000 Chess Olympiad to the BC Chess Reports page. NOTE: Change of Venue: The Victoria Spring Classic has been moved to Room D111 in the MacLaurin Building at the University of Victoria. On December 30, 2000, the Double Trouble (Simultaneous Madness) was held at the Vancouver Bridge Centre. Here are the crosstables for the main Double Trouble event and the Doubly Mad Blitz that followed it. All young players 5th-12th grades are welcome to participate in the International Chess Jam 2001, to be held Feb. 10 in Ferndale (south of Surrey, north of Bellingham). Regular chess tournaments at Esquires Coffee House Location: 4300 Kingsway, Burnaby, B.C. Canada Every Saturday, 5 round Swiss, 15 min. time control, first round 4:00, others asap, entry fee $5. NEW: Every Sunday, 5 round Swiss, 30 min. time control, first round 1:00, others asap, entry fee $7. Bring chess sets & clocks. Casual play welcome anytime. All ages, all levels. For further info. contact Daniel Chapman, ideez@yahoo.ca. The schedule for the Fraser Valley Chess Club Tournament has been updated. Some of the missing results are expected shortly; check for results of future matches as they occur later in the season. Updated the Provincial Interschool Team Chess Championship, and registration forms: provincial.pdf or provincial.doc. John Niksic pre-tournament favourite needed help from Micah Quinn, from Prince George who defeated Nick Taylor in the last round to give the win to Niksic. Niksic lost to Taylor who drew with Bob Mair thus the pairings in the last round were Niksic 3-Mair 2.5, Taylor 3.5-Quinn 2, the rest of the pack were out of contention. So Taylor snatches defeat out of jaws of victory. Very unusual results, many upsets. New link added for the Provincial Interschool Team Chess Championship, and registration forms: provincial.pdf(19,884) or provincial.doc (87,040). Washington players can participate in our junior tournaments. They do not have to pay CFC membership since it is free for juniors under 18 years old. Tournaments fees are $10 - 15. Looking forward to see some players from across the border. For further info contact Richard Krys rkrys@home.com. "Burnaby Now" newspaper is planning a front page news report on Esquires Coffee House and the Central Park Chess Club. There is a strong possibility they will have a reporter and photographer at next Saturday's weekly tournament, November 25,2000. The more chess players in attendance the better. Regular 15 min. tournaments continue every Saturday, 4:00PM to 7:00PM @ Esquires, 4300 Kingsway, Burnaby, B.C. Canada. For further info. contact Daniel Chapman, ideez@yahoo.ca. Alex Davies won the Silver Star Classic with 6/6. Central Park Chess Club is pleased to announce the arrival of "giant" size chess pieces available for play at Esquires Coffee House, 4300 Kingsway, Burnaby, B.C. Canada. Regular Saturday tournaments are continuing weekly at Esquires, and all levels of play are encouraged to participate. Please pass this info on to any interested parties. For further info contact Daniel Chapman, ideez@yahoo.ca. The Interschool Team Tournament will take place at York House School on February 24, 2001. More details will be available soon. 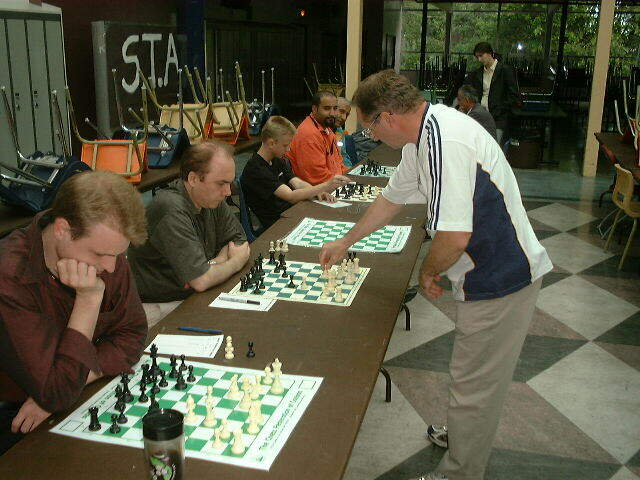 On August 26 and 27, 2000, a 24 hour Chess Marathon was held at the Vancouver Bridge Centre. Simultaneous with the Marathon event were four other events: the Mad Active, the Mad Blitz, the Midnight Active, and the Midnight Blitz.